LONDON (AP) — Wayne Rooney scored his 249th goal for Manchester United on Saturday to match Bobby Charlton as the club's joint leading scorer. 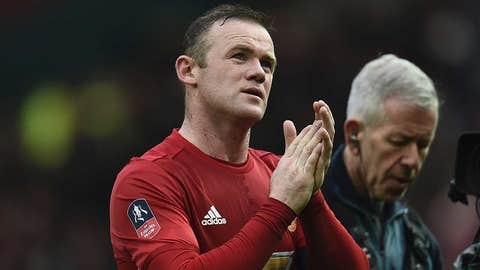 The 31-year-old Rooney came close to taking the record outright as the defending FA Cup champion swept aside second-tier Reading 4-0 in the third round of the tournament. Rooney, the record scorer for England's national team, struck in the seventh minute at Old Trafford. Rooney, who joined United in 2004 as an 18-year-old prodigy from Everton, almost grabbed his 250th goal when he was denied from close range in the second half of a one-sided contest. United is in a hot vein of form for manager Jose Mourinho after winning its eighth straight match in all competitions and dominated Reading, managed by former United defender Jaap Stam. Rooney, who spurned a great chance inside two minutes, did not have long to wait to reach his milestone, guiding the ball home from Juan Mata's clipped cross five minutes later. Rooney then turned provider as United doubled its lead on 15 minutes, playing in Anthony Martial who slotted a right-footed shot into the corner. Marcus Rashford made it 3-0 with 15 minutes to go, his first goal in 18 matches, and quickly added a fourth after a mistake from Reading goalkeeper Ali Al Habsi. Three all-Premier League FA Cup third-round matches take place Saturday with Everton hosting Leicester, Sansea going to Hull and Sunderland taking on Burnley. Arsenal plays Preston in the late game.